As most of you know, I don't like to waste things. Not food or fabric or bits of paper or ribbon, not a thing do I chuck away if I think I might have a use for it. Lately however, complacency has been creeping in and I am ashamed to say that I have, on more than one occasion thrown food away that I have let go too out of date for me to eat. Now I'm generally of the mind that if it looks ok and smells ok and has no obviously mouldy or icky bits then it's probably ok to eat. When I did my food hygiene course a few months ago, the man teaching the course almost had a fit when I happened to mention this and almost failed me on the spot. I hastened to add that anything I prepare for the market is made from completely fresh ingredients and following the hygiene course standards to the letter but, in my everyday cooking and eating, I am a little more relaxed about things like best before dates and such like. Yesterday, the weather was once again very grim. Grey and drizzly and not fit for anything other than snuggling up on the sofa so, as the previous week had been hectic I decided it was high time that I caught up on my blog reading. 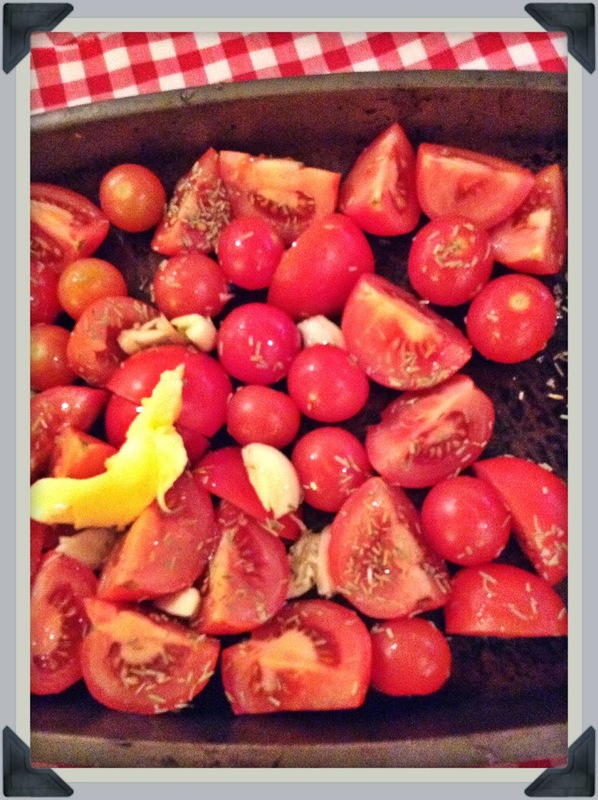 I follow loads of blogs and I love reading about how creative people are when making things last or cooking deliciously mouthwatering meals from hardly anything at all for a few pennies and so, with a new sense of purpose, I leaped off the sofa, grabbed the three bags of tomatoes that had been given to me by a market friend at the end of trading last week because they were too squishy to sell and it set about making some tomato sauce. A little olive oil, a knob of butter, four garlic cloves, some sea salt and an hour in a low oven while I was slow-roasting some beef and I was left with some delicious tomato sauce to pour over pasta or even blitz into some warming soup to eat with some homemade bread. Yesterday, I also emptied out my penny jar. I have gotten into the habit of putting almost all the 1p and 2p coins that I take at the market into the jar at the end of the week so it stops my cash box from filling up with coppers because I don't tend to use them. The jar wasn't full but it was getting heavy and even though I haven't been collecting them for very long, I was quite curious to see how much was in it. So, I nipped along to my local Morrisons store, which has one of those coin counting machines and after I had removed the screws, curtain hooks and the odd dog biscuit that had gotten mixed in with the coins ........ who knows how on earth that got in there ....... I dumped the whole lot into the machine and waited for it to count them. 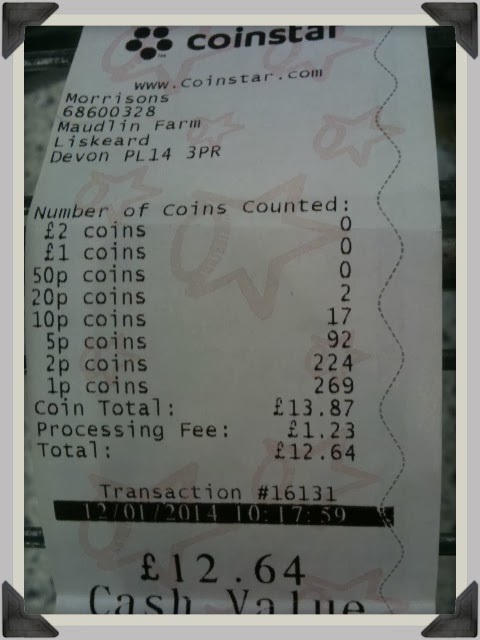 There was a grand total of £13.87 before the counting fee was taken off which considering there was hardly any high value coins in the jar, was pretty good. I now have a massive total of 6p in my penny jar and the Terramundi pot that I got as a Christmas present has the £1 and £2 coins in it that I'm saving and any bank notes I can spare to put towards my greenhouse fund. And finally for today, my next project ..... find some more egg recipes! My two hens, Pepper Potts and Amelia Pond are still happily laying me two eggs a day and consequently I have a fridge full of fabulous eggs but to be honest, I'm getting a bit swamped. I have never known such prolific chickens my friends and neighbours who keep chickens are all bemoaning the fact that they are hardly getting any eggs at all and yet my two are still laying like crazy. I'm thinking that I might actually have a go at making some meringues. Does anyone know if you can freeze meringues? That might solve the problem temporarily, along with a few quiches to freeze. Also, I have heard that it's actually possible to freeze eggs. Apparently, if you crack the eggs into a bag or a tub and write on how many are in there you can pop them into the freezer and use them for making scrambled eggs or cakes, things where the eggs are mixed or whisked. Has anyone else heard of this and has anyone actually tried freezing eggs? I would be very interested to hear from anyone who has and would love to know how they turned out. I've frozen eggs and they were fine for scrambled egg, omelettes and quiche. They need to be whisked before freezing. Jane Sarchet at The Hedge Combers lives in your corner of the world and has a great collection of eggy recipes - worth a google for the url! I found a delightful little book called "The Good Egg" by Loretta White. It's very old and I guess it's out of print but I bought mine for 1p plus postage on Amazon. Hope you can get a copy and good luck. It is a shame that sell by dates have taken away some of our choices. I like a ripe brie, a fully ripe melon, but now according to the sell by dates I can't buy them! I think egg quiches can be frozen. I separate eggs and break the yolks up with a fork, just write how many on the label they go into quiches or custard. The whites I freeze in 4,s as that is how many I use for meringue. They always turn out fine. I too often freeze egg whites and they are fine for meringues. I have also frozen lemon or gooseberry curd without any problems. Pepper Pots & Amelia Pond? Quite possibly the cutest chook name I have ever heard!